Turning your dimes into dollars! You Design. You Order. We Ship. No Hassle. 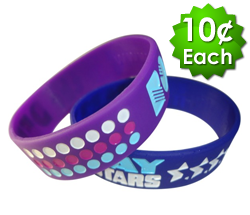 Welcome to 10Centwristbands.com. 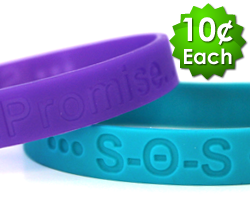 We pride ourselves on producing the highest quality, lowest price custom silicone wristbands anywhere! 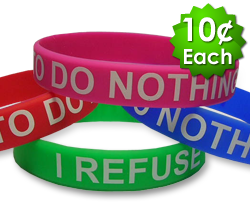 We make shopping simple and all of our wristbands start at just $ 0.10 each! More importantly, our customer service is second to none. 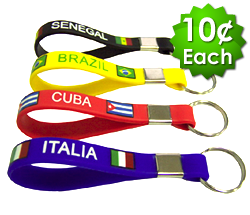 We ensure this by providing our Toll Free number, Online Live Chat, Email, Facebook and Twitter contact information boldly on our site so that our representatives can help you with any questions and placement of your order. 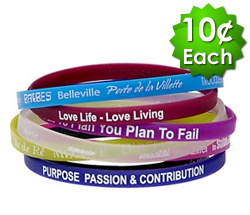 You will notice right away that ALL of our custom wristbands and silicone bracelets include FREE options that our competitors simply can’t match such as; FREE Clip Art and FREE Unlimited Text on your custom bracelets. We top off our Industry Low Pricing and Superb Customer Service with our Expert Analysis and Fundraising Technique Applications. 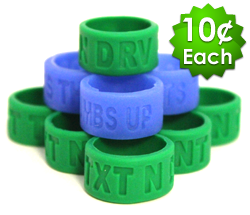 Through our proven history of using custom wristbands to support thousands of fundraising campaigns from Alzheimer’s to Zoo Fundraisers, we can show you exactly how to turn your Dimes into Thousands of Dollars! Take a moment right now to Chat with us LIVE, or Click here to Email us, or Call Us Toll FREE, we are here and excited to help you raise money for your campaign, cause, class or club in ways you wouldn’t think possible!